Earth is a habitable planet due to the balance of carbon cycling between subsurface and surface environments. Without this deep carbon cycle, we would have neither the climate we know today, nor a breathable atmosphere. Scientists have long thought that carbon emitted from volcanoes is an important part of this balanced equation, but the exact origins of volcanic carbon are difficult to find and quantify. 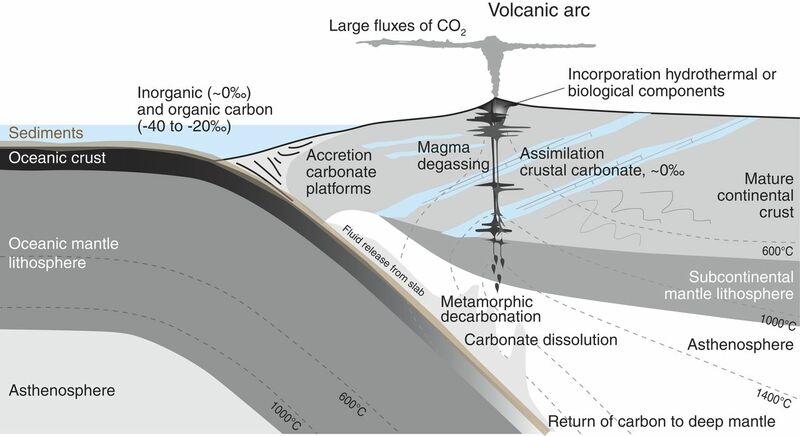 A new study by Marie Edmonds (University of Cambridge, UK), Co-chair of the Scientific Steering Committee for the Reservoirs and Fluxes Community, and Chair of Synthesis Group 2019, and colleagues, finds that arc volcanoes recycle a large fraction of their carbon from Earth’s crust, rather than drawing from deeper sources. Arc volcanoes form along the edge of collision boundaries between two tectonic plates, usually when oceanic plates “subduct” or sink beneath continental plates. The findings suggest that a smaller percentage of deep subducted carbon outgasses through volcanoes than expected, which has implications for studies of Earth’s past climate and for the return of carbon to the deep mantle. The researchers report their findings in a new paper in the journal Science . In the past, scientists have attempted to understand the origin of carbon in volcanic emissions by studying their isotope profiles. Isotopes are atoms of a chemical element containing different numbers of neutrons in the nucleus, which alters the mass of the atom but not its chemical properties. Carbon from Earth’s crust, mantle, and the slabs of tectonic plates that sink into the mantle during subduction have different isotope signatures, which scientists can detect in volcanic emissions that come from those sources. Carbon isotopes, however, can only reveal part of the story. For example, limestone, which forms from organic debris along the bottom of the ocean, has the same isotope signature when found in the crust as limestone that has undergone subduction. In these cases, helium isotopes are useful for distinguishing between surface and subsurface carbon sources. The detection of large proportions of light helium signals that volcanic emissions came from Earth’s interior, while primarily heavy helium signifies that the carbon came from the crust or recycled surface limestone deposits. Combining data on carbon and helium isotopes is a powerful tool for determining the origin of volcanic emissions. First author Emily Mason, an undergraduate student in Edmonds’ lab, conducted an extensive literature review and compiled global carbon and helium data from studies of arc volcanoes. She discovered that some arc volcanoes are degassing carbon with greater concentrations of a “heavy” carbon isotope than other types of volcanoes. Some also emit heavy helium from the crust, suggesting that the carbon came from shallow sources, rather than from carbon that had entered the mantle through subduction and returned to the surface. Volcanic arcs in Italy, Papua New Guinea, and Indonesia are some of the biggest heavy carbon emitters. These arcs once bordered the ancient Tethys Sea that separated the Gondwana and Laurasia supercontinents, said Edmonds. She thinks that thick carbonate deposits formed in this warm, shallow sea which were scraped up during subduction onto the crust, to be later picked up by ascending arc magmas and released into the atmosphere. In studies of Earth’s past climate, paleoclimatologists have assumed that the isotopic profile of carbon emitted from volcanoes remained constant, and matched the isotopic profile of Earth’s mantle. In light of the new findings, estimates of ancient carbon flux likely need to be adjusted. “This has huge implications for calculating the fraction of organic carbon that has been buried through geological time, and for how much time oxygen has been in the atmosphere,” said Edmonds. The new study is in line with DCO’s goals of synthesizing data for its 2019 culmination, but more volcano emissions data are still needed. DCO’s Deep Earth Carbon Degassing (DECADE) initiative, which monitors 20 of the world’s most actively degassing volcanoes, and the Trail by Fire project, to measure gases from volcanoes in the Andes, have made great strides toward understanding volcanic carbon flux, said Edmonds, but many areas are still under-surveyed. Papua New Guinea, for example, has just two data points. Schematic diagram to show the possible sources of carbon in a subduction zone volcanic system and the processes that might fractionate carbon isotopes.